Take a thrilling trip over Malibu, California, with this tandem paragliding experience. Admire the Malibu hills and calm, azure waters of the Pacific during your motorized or non-motorized flight with a certified instructor. Safety equipment and a safety briefing are included, so all you have to do is relax and enjoy the ride. Don't miss this chance to inject some adrenaline into your vacation and get a birds-eye view of gorgeous Malibu! 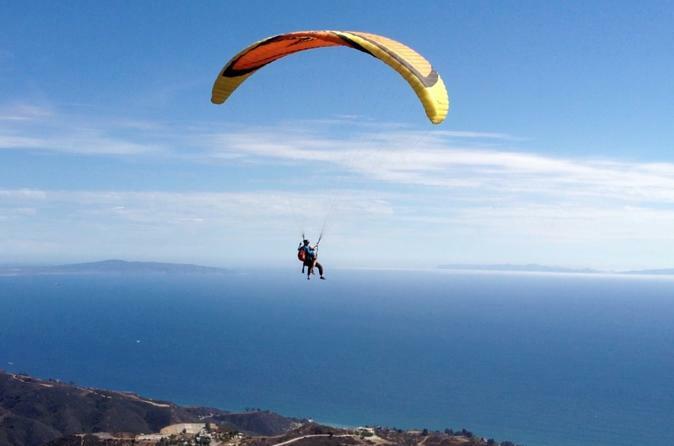 We offer Paragliding flights from our mountain sites in Malibu as well as Paramotor from the beach. Occasionally the beach is too narrow because of higher tides or the wind is not favorable so we can only offer Paragliding and in that case you can pay the additional charge on site. Thank you for understanding that safety is our main concern! Meet at Carbon Beach in Malibu (or in Ojai, depending on wind conditions) to begin your tandem paragliding adventure. A paraglider is an inflatable wing made of nylon that allows a sensation of effortless soaring. Choose between a 20-minute motorized flight that takes off from the beach or a traditional 30-minute non-motorized flight that embarks from the top of a bluff. After a 10-minute safety orientation, you'll be strapped into the paraglider's harness with your highly-experienced pilot. Your pilot will handle the mechanics so you can focus on taking in the beauty all around you. Marvel at stunning views of the Malibu hills and Pacific Ocean — you can even carry along a small camera to capture photos! Your breathtaking flight ends with touchdown on Carbon Beach.